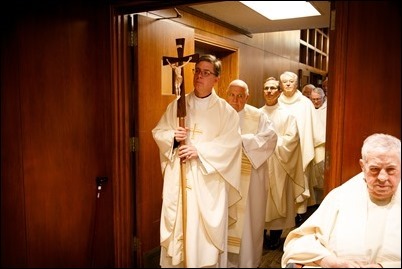 Last Friday I went to St. Paul School in Hingham to celebrate a Mass to mark the school’s 65th anniversary. We were very happy to be joined by a number of the Sisters of Charity to Halifax who are the founders of the school. Afterwards, I made a visit to the school and stopped in at the school’s Grandaparent’s Day celebrations. 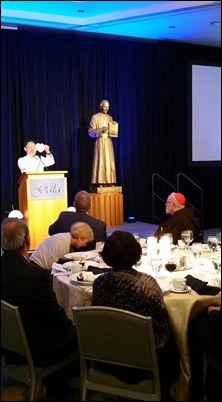 On Friday, I had one of our regular dinners with a group of seminarians. 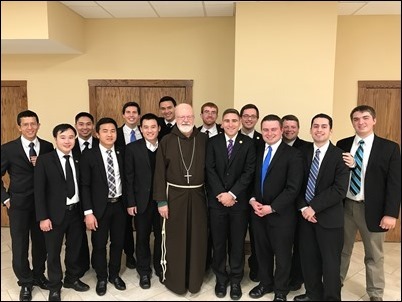 This time I met with a group from St. John’s Seminary, as well as several of our college seminarians studying at Our Lady of Providence. 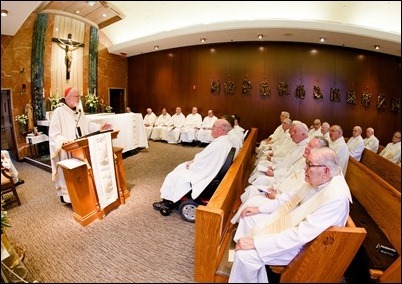 It is always very encouraging for me to be together with our future priests, and these gatherings give us a chance to discuss various issues in the Church and the world. 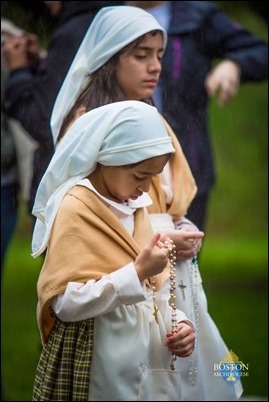 Saturday, I went to the Fatima Shrine in Holliston for their celebrations to mark the 100th anniversary of the apparitions of Our Lady of Fatima. 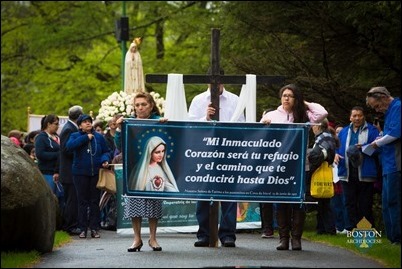 The Marian Association of the Hispanic community organized the procession, rosary and Mass at the shrine. 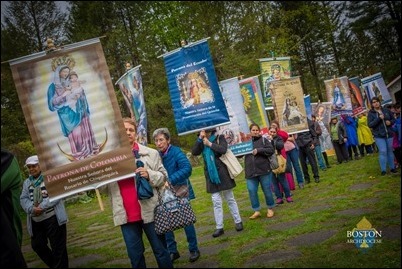 Despite the fact that the weather was not ideal, we were still joined by several hundred participants for the coronation and procession with banners of the various Latin American and Caribbean countries represented by the faithful. 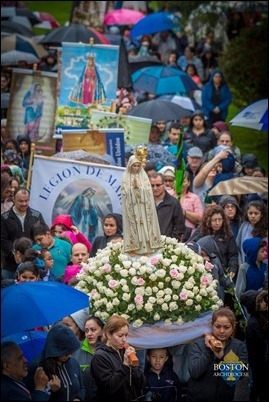 It was a very beautiful, enthusiastic celebration in honor of Our Lady and the devotion of the people was a very inspiring sight. 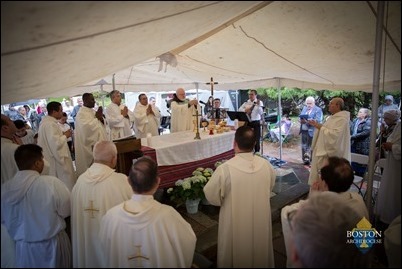 We are so grateful to the Xaverian Missionaries who run the shrine for hosting this wonderful event. 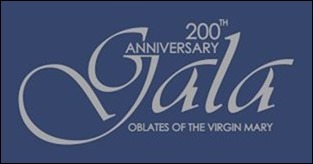 That evening, I attended the gala dinner celebrating the 200th anniversary of the Oblates of the Virgin Mary and their 40 years of ministry in Boston. 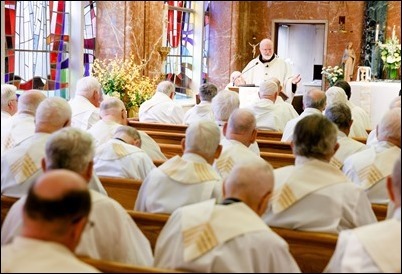 It was an opportunity to express our gratitude for the wonderful ministries carried on by the Oblates at St. Clement Eucharistic Shrine, the St. Francis Chapel at the Prudential Center and their St. Joseph’s Retreat House in Milton. 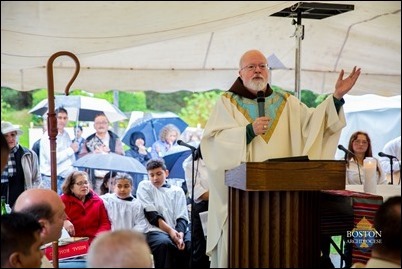 They have a very important outreach to young adults in our archdiocese, they provide a great deal of spiritual direction and, of course, they began the ministry of perpetual adoration at St. Clement Shrine. 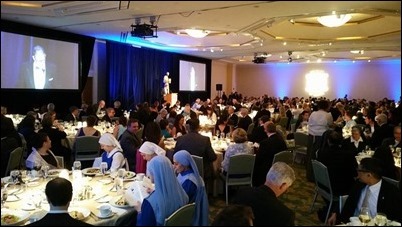 We are very grateful for all that they do, and I was very pleased to be at their gala to congratulate them and to express our thanks on behalf of the whole archdiocese for their devoted ministry. 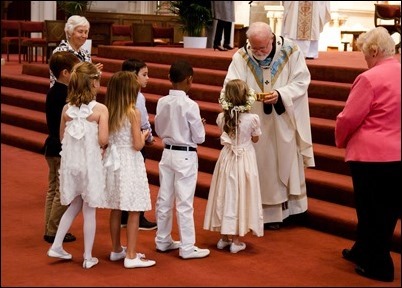 On Sunday, we celebrated the First Communion Mass for the English speaking children in the Cathedral Parish. This is something relatively new for us. 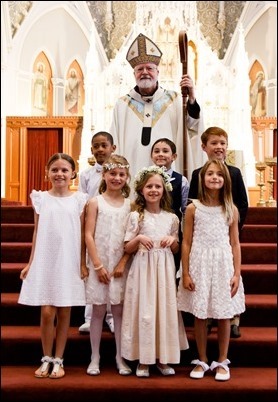 A couple of years ago, Father O’Leary began catechetical programs in English to serve the young families that are moving into the South End, and the result was this First Communion class. 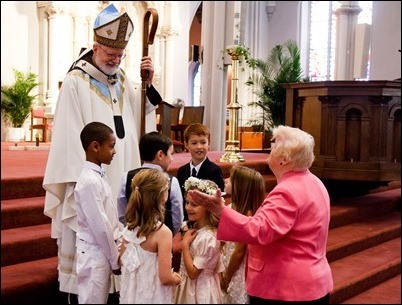 We are so grateful to Pamela Hennessey and Sister Ruth, who prepared the children for their First Communion. 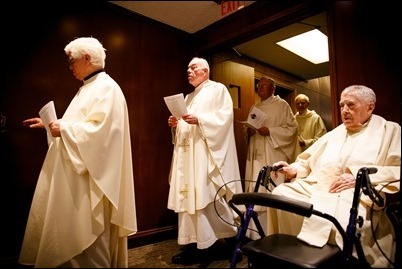 They all participated very actively in the liturgy and read the petitions. 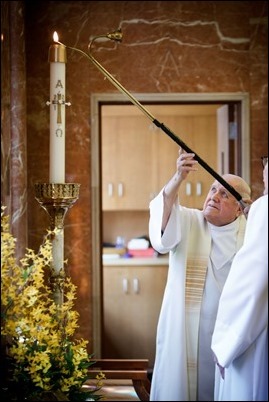 At the end of the Mass we also had a special blessing for the Cathedral, as we prepare for renovations of the upper church. 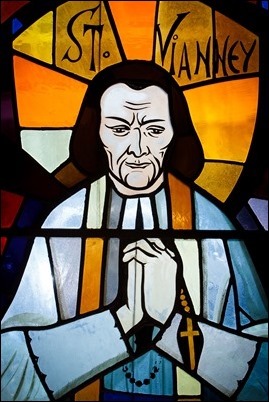 Masses will be held in the lower church and in the Blessed Sacrament Chapel to allow for the renovation of the main sanctuary of the Cathedral. 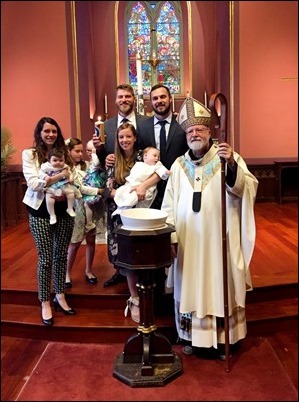 That night, we celebrated the baptism of Matthias Jablonski, the child of Lucas and Faith Jablonski, who are a couple in mission in Boston with the Neocatechumenal Way. 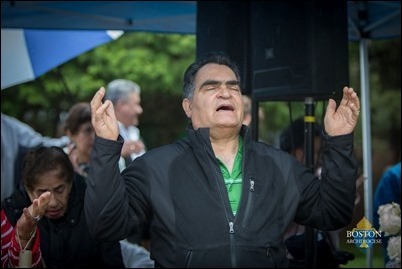 There were a very large number of family and friends there with us, and the celebration concluded with the rousing rendition of Recucitó! 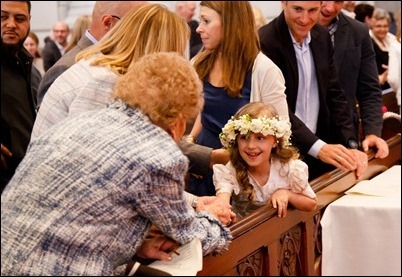 It’s always a joy to be able to celebrate the sacraments with families. 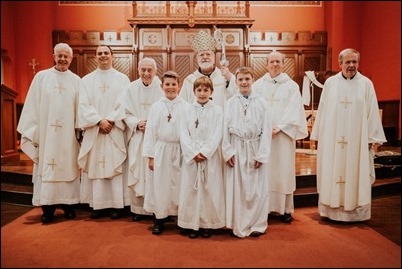 Throughout our parishes, this time of year is a time of First Communions, Confirmations and weddings — a time when the sacramental life of the parish flourishes. 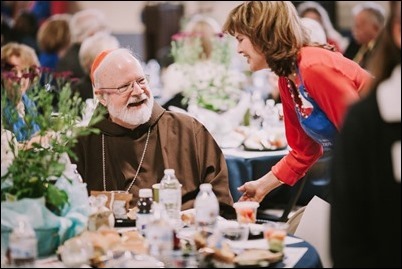 It’s always a great joy for any priest or bishop to be part of those celebrations with our Catholic families. 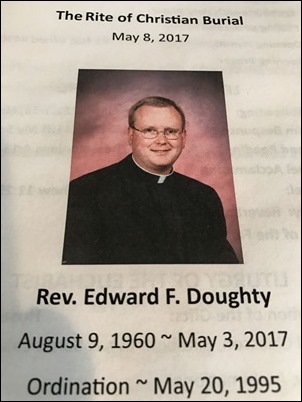 Monday I celebrated the funeral of Father Ed Doughty at St. Theresa of Lisieux Parish in Billerica. 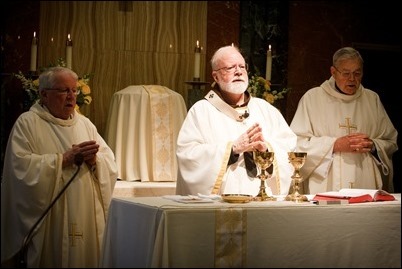 Father Doughty passed away last Wednesday after a long convalescence and struggle with a heart condition. As I mentioned in last week’s blog, I had visited with him in the hospital in the days before he died. 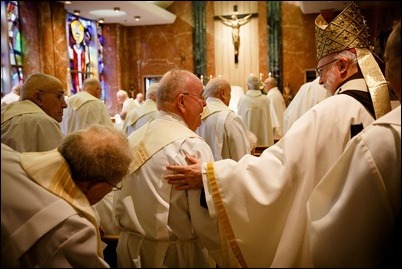 We had a wonderful conversation about his priesthood, his life, the fraternity of his brother priests, and his acceptance of God’s will in his life. I was encouraged by his condition at the time but, sadly, he took a turn for the worse. 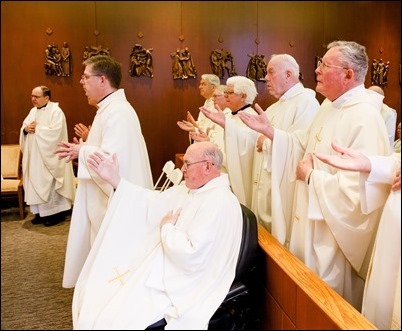 His mother and sisters were there with us, along with their families, as were many of his brother priests, including several of his classmates. 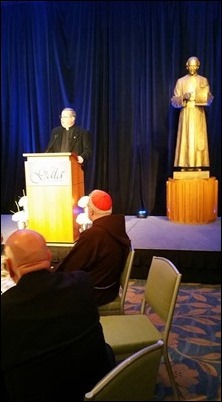 His niece also gave a very moving reflection on his life. It was a very beautiful sendoff. 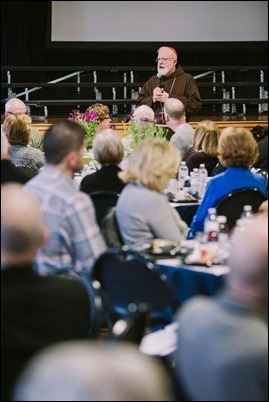 It was a sad moment to bid him farewell, but as we celebrated his funeral in the midst of the Easter season, it was a strong reminder of our Easter faith and our hope in the Resurrection. 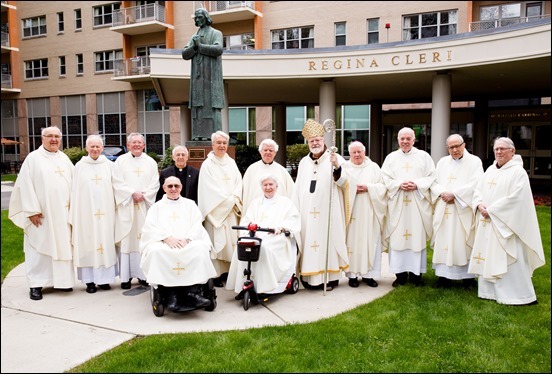 Tuesday, I went to Regina Cleri to celebrate the Mass with the jubilarian priests who are celebrating their 50th anniversary of ordination. 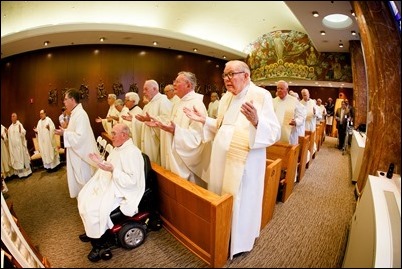 There were 19 priests in the archdiocese celebrating their Golden Jubilees. Not all of them are residents at Regina Cleri, and some are members of religious of communities who also joined us for the celebration. 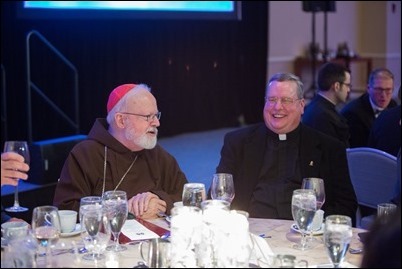 As I said in my homily, these are priests whose ministry has touched the lives of thousands upon thousands of people over the last five decades, which has been a time of great challenges for our Church and the world. 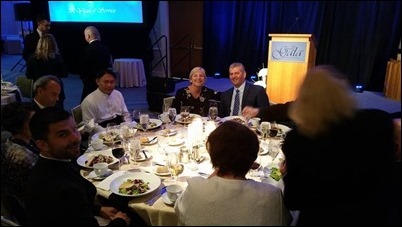 So, I was happy to be part of the celebration to honor and thank them. Afterwards we had a very nice meal to mark the occasion. 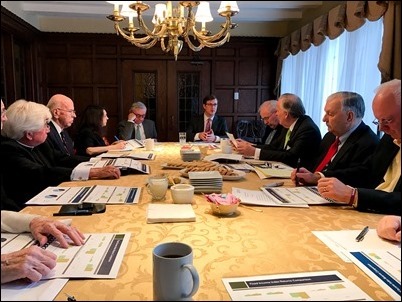 Wednesday, we had our annual meeting of the board of the Society of St. James the Apostle, better known simply as The St. James Society. 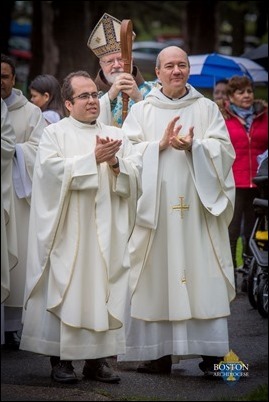 There are presently about 20 priests serving in the St. James Society and three more priests will hopefully be joining the mission very soon, working in some of the poorest areas in Peru including the shantytowns surrounding the capital city of Lima. We are preparing for the celebration of the 60th anniversary of the society and I look forward to going to visit them to celebrate that happy occasion. Also Wednesday, I was visited at the cathedral by Cardinal Arlindo Gomes of Cape Verde. 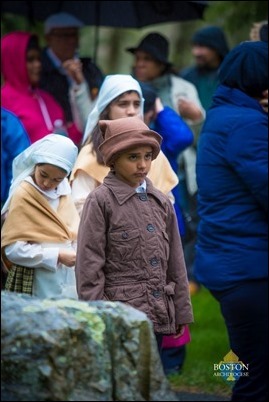 He is here to preside at Fatima celebrations with the local Cape Verdean communities. 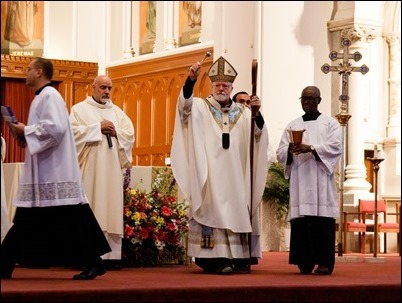 During his time here, he will visit Roxbury, Brockton, New Bedford and Providence and have celebrations with those communities. 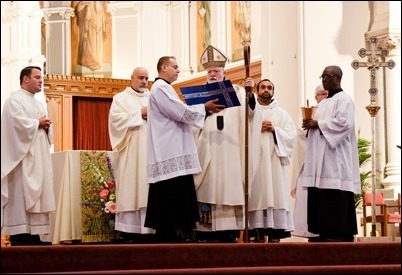 He was accompanied on his visit by Father Irineu Costa Correia, who is one of his priests on loan to the archdiocese and is serving the Cape Verdean community here. 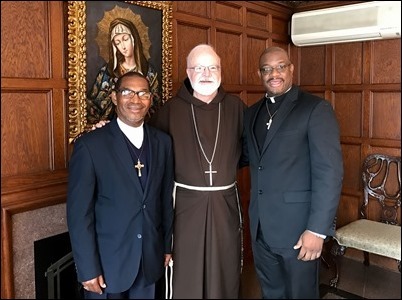 We are very grateful for the generosity of the cardinal in supplying us a priest, and we are very happy that he was able to visit with the members of the Cape Verdean community here. 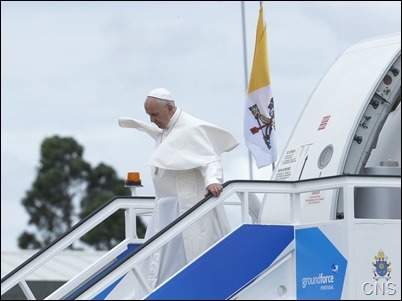 It is also a chance for them to really celebrate that they have a new cardinal in their country. 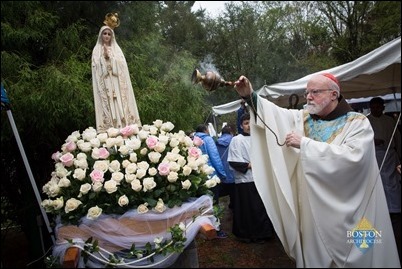 As you read this I will have already arrived in Fatima to be together with Pope Francis for the centennial celebrations of the apparitions of Our Lady and the canonizations of two of the visionary children of Fatima. 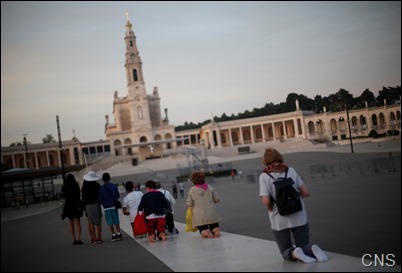 There are several groups in the archdiocese that are making a pilgrimage to Fatima during this time. 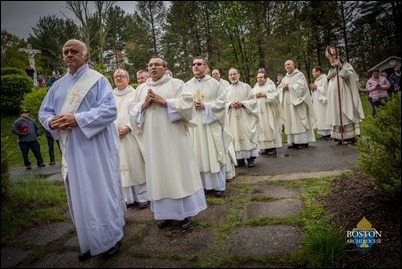 Rest assured that while we are here, we will be praying for all our priests and people in the archdiocese as we engage in this pilgrimage.